Crawler Roadheader(ZWY)Introduction of Crawler Roadheader(ZWY): The crawler roadheader is a type of underground coal mine roadheader machine mainly used in rock roadway coal mining, semi-coal rock tunnel, railway tunnel engineering/projects, national defense caves, etc. Tunnel RoadheaderDescription of Tunnel Roadheader: The tunnel roadheader, also called tunneling roadheader or mining road header, is mainly used in underground tunneling both for mining and municipal government projects. And it can also be utilized in building of wine caves and cave homes such as those found in the Coober Pedy area of Australia. The mucking road header is also called boom-type roadheader, road header machine, or just header machine. 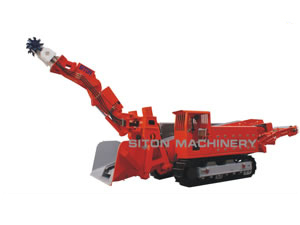 It is a kind of excavating equipment made up of boom-mounted cutting header, loading device usually involving a conveyor, and a crawler traveling track to move the entire machine forward into the rock face. The mucking road header is widely utilized in the excavation of underground mining and tunneling both for mining and municipal government projects. It can also be used to build wine caves and cave homes such as those found in the Coober Pedy area of Australia. Besides, it has become an alternative to full-face tunnel boring machine in various configurations and sizes without disturbing the surrounding rock face. 1. In this mucking road loader, the conventional drill-and-blast method has been replaced by the road header in soft rock excavation. 2. As the boom-type roadheader has the capacity to excavate and clear muck from the tunnel simultaneously, it is more flexible and versatile in soft to medium rock excavation. It completes the work with additional ground support in the form of rock bolting, shotcrete, steel supports, or a combination thereof. 3. 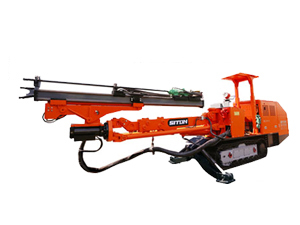 The mucking roadheader or road header machine, as a mechanical excavation facility, can also cut a series of cross-sections, change diameters and directions quickly, and move towards and away from the face by using its own power. 4. This roadheader is available in built-in safety features, such as a water-jet spray. 5. The heaviest mucking roadheader weighs as much as 120 tons with the maximum power that generated from the cutterhead topping of 500kW. Note: The above parameters are only for reference. They may be different from the actual parameters.